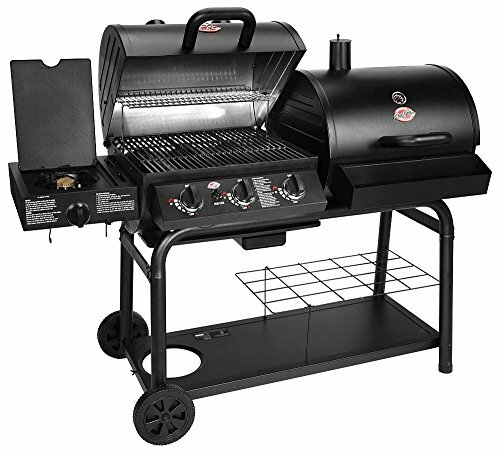 When it comes to grills, Char-Griller offers one of the most low-priced ones in the market. If you’re a budget conscious buyer, you’ll definitely want to check out their products in almost any big box store across the country. These are no-frills grills, meaning they aren’t built to go with the decor of your patio. They’re marketed as real grills for real people, sold at a fair price. 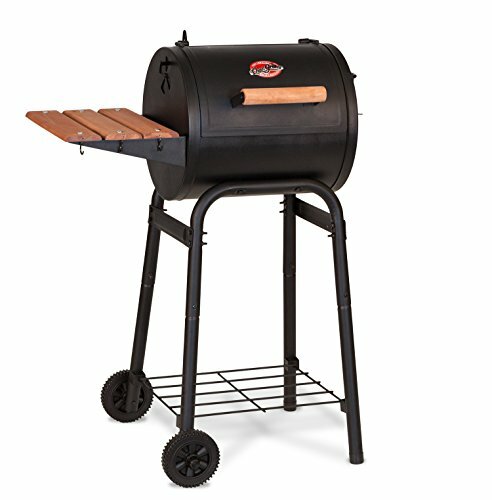 If you’re looking for a fairly priced mini charcoal grill, you might want to check out this product from Char-Griller. For a small charcoal grill, the Char-Griller Patio Pro is worth more than what you paid for. It has a reputation of lasting several years despite frequent cookouts. If you have a small backyard and a small family, the Patio Pro is definitely something you should consider. While it’s not perfect, the results will show that owning one is totally worth it. 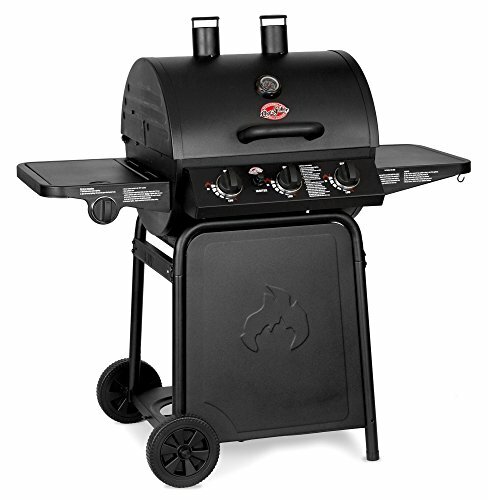 If charcoal isn’t your thing, Char-Griller also offers a small-sized gas grill that’s of great value – the Grillin Pro. There’s a great deal to love about this gas grill from Char-Griller. In a surprisingly unconventional move, Char-Griller created a gas grill using a charcoal grill’s body and it worked out perfectly. With it’s barrel-shaped design, the Char-Griller Grillin Pro is able to distribute heat evenly. And because of its heavy steel body as well as its porcelain-coated cast iron cooking grates, the gas grill is able to reach high temperatures fast and hold the heat well. One nice feature that the grill has is the individual temperature controls for each burner, giving you more versatility. The side burner can also be used as an extra grill or for cooking sauces, etc. Basically, what you want from any grill is to be able to deliver deliciously grilled meals to your table and the Grillin Pro definitely delivers. Of course, like any other grill in the market, there are some flaws. The plastic wheels leave much to be desired. Assembling the grill is difficult. And cleaning as well as maintaining the grill can be a hassle sometimes. 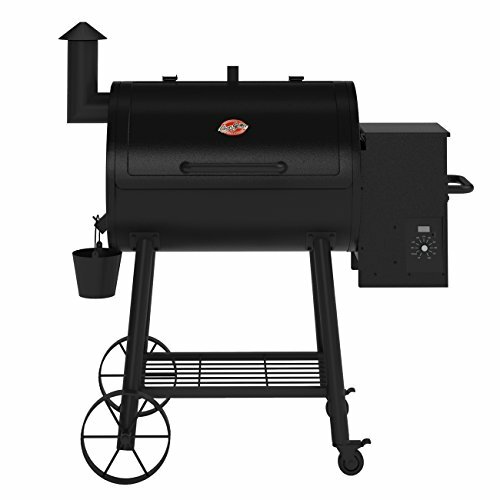 But for its price, you get a lot more than what you paid for – a solidly constructed gas grill that will serve you countless BBQ meals over the next several years. If you can’t decide on whether to go with a charcoal grill or a gas grill, then you might want to check out Char-Griller’s DUO – a combination of a gas grill and a charcoal grill in one. So, what can this dual fuel grill do? Well, the gas grill works perfectly. The steel body is heavy and solid so the heat is retained well. The burners heat up fast and can reach pretty high temperatures. The grill can also keep the temperature steady as long as you need it (which won’t be long since it also cooks things pretty fast). It’s pretty easy to control temperature because of the independent temp controls for each burner. Each grill has a large cooking capacity so even if you use only the gas grill, you’ll still get a decent amount of food for a small party. What about the charcoal side? Well, there are good things. The charcoal rack can be raised and lowered to provide better temperature control while cooking. If you buy the optional firebox, you’ll be able to use the charcoal grill as a smoker as well, adding to the grill’s versatility. Unfortunately, the grill is a DIY project for owners. The thick metal and the cast iron cooking grates hold the heat well. However, some customers have found that the lid doesn’t seal the cooking chamber slightly, so heat and smoke escapes. They needed to add some modifications before the charcoal worked perfectly. Aside from the slightly shoddy construction on the charcoal grill, other complaints have been about the entire grill’s propensity to rust. Some have found that an extra bit of TLC can help prevent rust from happening. Some state that their extra TLC prevented nothing. The statements are contradictory and hard to prove which ones are true. There are a lot of factors that could have helped produce rust in metal – weather, heat, etc. For future buyers, you’ll either risk the chance of rust or not. Looking at the DUO, you get a real steal with this gas and charcoal combo especially at the price they’re selling it. And a lot of people have been wowed by the results of using the charcoal grill with the optional offset firebox. You have the convenience of a gas grill for cooking meals after a long day at work and the thrill of a charcoal grill for those lazy Saturday afternoons with the family. However, because of the price, you shouldn’t be surprised that the quality of the materials used isn’t like that of a Weber. You might find yourself down one grill in the span of a year. Fortunately, you’ll still have one left to cook with. And for a deal like this, you just may find that the risks are all worth it. 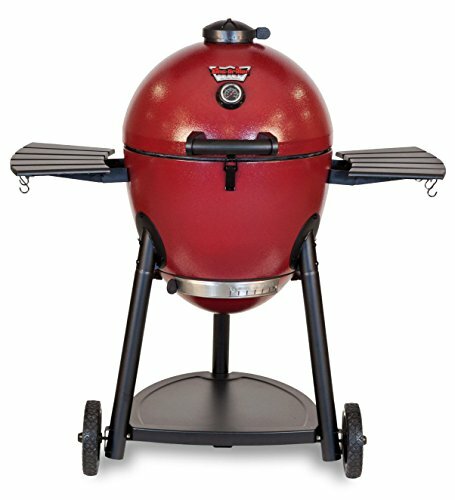 Typically, Kamado grills are really expensive. But, as we all know, the investment is totally worth it. Unfortunately, not all of us have that kind of money to spend, and we’re left salivating over what it would be like to actually own one. Until now, that is. Char-Griller is a manufacturer that is widely known for producing decent enough grills at a really low price. This time, they have produced something way better than “decent enough.” The Kamado Akorn is a big step up in terms of delivering top quality performance at less than half the price of a traditional Kamado grill. Before we go into the details of this amazing grill, let’s talk features. The Kamado Akron isn’t the cheap version of the expensive ceramic kamados in the market today. It may be made of steel, but it definitely performs pretty close to traditional Kamado grills such as the BGE. This is because the Akron is triple walled to ensure that the grill is able to hold in the heat consistently and far more efficiently than any charcoal grill. This means that you’re able to burn less coal but still reach those really high temperatures (max of 700 degrees Fahrenheit). The Akron is built to seal tight so you can also expect it to cook low and slow at 200 degrees Fahrenheit for long periods of time, making this grill an excellent smoker as well. Aside from virtually identical results with those high-priced ceramic Kamados everybody’s raving about, the Akron has other benefits too. It’s lightweight and easily portable – something that ceramic grills aren’t known for. They certainly aren’t fragile either so you don’t have to worry about dropping them. The side tables come with hooks for your grilling tools and utensils. The ash pan is easily removed for cleaning. And with a little bit of practice (as is always the case with charcoal and kamado style grilling), using the dampers is a breeze. In Kamado style grilling, it’s very easy to overshoot the temperature. It isn’t as easy to cool it down to the desired temperature. The Akron faces the same problem that all Kamado grills face since they are all built to retain heat extremely well. So you can’t expect to serve a deliciously grilled meal on the same day you get it. You’ll need to do some trial runs before you go for a real meal. Another thing that concerns us is durability. How long will this grill last? Char-Griller isn’t always known for producing long-lasting grills. Some customers have already complained that the high heat burned off the paint and enamel protecting the steel from rust. The verdict: This is truly an exceptional Kamado style grill in terms of cooking performance. There’s no question that it ranks equally with the traditional ones in the market today. If you want to try out what the big deal is about Kamado grills, this is a great way to do it because the Akron is sold at such a very low price. There’s no big investment involved. You also don’t have to be so careful in transporting it when needed because it’s not fragile at all. The best part? You can use the years with this steel Kamado to save up for a ceramic one that lasts a lifetime. If you want a charcoal grill because of the flavor it gives your meat but also would like something that’s more set-it-and-forget-it, then you should definitely consider getting a pellet grill. And if you’re worried about the cost of a pellet grill, don’t be. Char-Griller offers an inexpensive one that has excellent cooking performance. Nothing beats the price. Pellet grills are generally expensive but they more than makeup for it in terms of versatility. You can grill, roast, smoke, and bake with a pellet grill. Char-Griller’s Wood Pro offers you that same versatility along with great cooking performance that rivals those high-end pellet grills you find in the market today. In fact, many have compared it with Traegers’ pellet grills and their reviews state that this newcomer definitely made the grade. While Char-Griller isn’t well-known for its durability (manufactured in China), they seem to have quality in mind when they built this one. The Wood Pro is built like a tank and seem sturdier than other pellet grills out there. The wheels make this huge grill easily portable when needed. And the collection bucket for the drip pan makes cleaning up after a cookout the easiest thing ever. Another feature we love about this pellet grill is the temperature control and digital thermostat. You can easily set the temperature you desire and just forget about it while your meal cooks to perfection. As an bonus, you can even set the amount of smoke you want to use on your meat. While the Wood Pro looks sturdy enough, there’s no telling really how long it will last. Most Char-Griller products generally last a few years. Some customers have complained about how hard it is to get replacement parts while others have problems with their Wood Pro right out of the box. The latter could probably be said for a lot of other brands. All in all, the Wood Pro is a great deal for those who are looking to buy a quality pellet grill at a low price. According to some owners, it has definitely surpassed the cooking performance of a Traegers pellet grill at almost half the cost.